The Vertical Conveyor requires only 30% of the space of a conventional inclined screw conveyor. Both horizontal and vartical screws can be removed or installed by a single action for thorough cleaning of components. 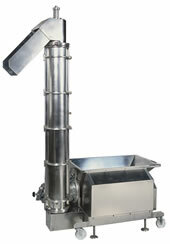 This model is available conveying powders, particles and viscous materials.